How should I use Vocular? Find a quiet room with no echo and no one else speaking. Tap the V button to start taking a sample. The red band should start to jump out as it detects frequencies. Speak for about 30 seconds. Try and do this naturally, as if talking to a friend. Once you feel you’ve said enough. Tap the button again to end the recording. The V should start pulsating as it calculates your results. Be sure to check out your Pitch Count too. This refers to the number of times Vocular has been able to detect a frequency from your voice, so a low count (below 200) means that your sample might not be accurate. What results should I want to get from Vocular? This answer is split for men and women, so I’ll answer either separately. If you’re a man, you want to have a deep voice. Numerous studies have shown that men with deeper voices are considered more attractive, more dominant, more intelligent, more confident, more electable – they even earn more than guys with higher voices. If you’re looking for a figure, one study found that the most attractive male voices had an average pitch of about 96Hz (deep, but not very deep). Things are more surprising when vocal variance is considered though. On the one hand, men with monotone voices are seen as being more dominant and report more sexual partners. On the other hand, a more varied voice seems to be more engaging. So there’s a strange ‘bedroom and boardroom’ effect – you want to be able to ramp up the variety when giving a speech, but cut it down on dates. Women have a similar ‘bedroom and boardroom’ effect with voice depth too. Higher voices are rated as being more attractive to men, but lower voices are rated as being more dominant. As for variance, I couldn’t find any studies focusing on the female voice, but I would bet that there’s a similar polarity – with a lack of inflection being taken to be more authoritative while a more varied tone is more attractive. Can people really deepen their voices? Yes. Margaret Thatcher most famously did, as you can see in this YouTube clip. Actors like Morgan Freeman and Matthew McConaughey have also talked about the same thing. In fact, Freeman cited learning to lower his pitch as the first major step he took towards becoming an actor. I’ve written a pretty extensive list of methods in this post – but to give a bitesize version of it, you want to stretch and strengthen your neck muscles, breathe from the diaphragm and learn to speak with a descended larynx. You can also upgrade Vocular to get the pitch-tracker which tells you your pitch in real time, so you know exactly when you’re hitting lower notes. But isn’t this all about the length and thickness of your vocal chords? Not really. It’s true that the length and thickness of your vocal chords do affect the depth of your voice, but these are not the only factors. If they were, you’d be unable to change the pitch of your voice at all, higher or lower. Tension is also a big factor in determining your voice depth. This is why your morning voice is usually significantly deeper than your voice at, say, 3pm – your neck is relaxed from hours of sleep. And the good news is, this is something you can learn to control with a range of techniques. But don’t take our word for it, take Morgan Freeman’s. This isn’t to say that there’s no physiological limit on the depth of your voice – there is. Jennifer Aniston is never going to sound like Barry White (no matter how much she dearly wants to). But what this does say is that the determinist idea that ‘you’re stuck with the voice you have’ is equally wrong. But in any case, these questions kinda miss the point about Vocular. Vocular is not just about learning to speak with a deeper voice, or a higher voice. We want to expand to other areas that make a distinctive voice – smoothness, resonance, nasality. Depth is just a starting point. Does Vocular accept responsibility for any injury sustained in using the app? No, and we expect our users to be smart enough to use this app without harming themselves – this section is just here for our own protection. If you feel at all like you could be damaging your vocal chords then stop whatever you’re doing immediately. Why does my voice sound deeper to me than Vocular says it is? There are three reasons for this. Firstly, when you hear your voice as you speak, you hear it not only through your ear drums (as everyone else does) but through vibrations in your skull, which makes your pitch sound lower to you than it does to everybody else. Thirdly, people often find themselves becoming nervous when using Vocular, which inevitably raises the pitch of their voice. Take your time to get accustomed with using Vocular and feeling comfortable with it. If you have any doubts about the validity of the recording, you can always listen back to it in the Analysis. Why don’t I sound like any of my matches? The idea of the celebrity matches is simply to give you a grounding of your voice depth. This doesn’t take into account factors like accent, nasality, smoothness of voice – only your tone of voice and the extent to which it varies. So, if Vocular says you’re a 100% match with Sean Connery, it doesn’t mean you have a Scottish accent, just that you speak with the same pitch distribution. How does the voice depth calculation work? In most scenarios, the voice depth calculation works simply by taking your lowest frequency of which they are 5 or more instances. Thus, your voice depth result is the deepest significant frequency you speak at. However, there are complications. Many women speak with a register called ‘vocal fry’ – this is that low, creaky sound, particularly common in young American women like Kim Kardashian or Anna Kendrick. Vocal fry occupies a territory between 75Hz and 110Hz for women, and so it needs removing from the results. If we didn’t, a lot of women would get reported as having voices as deep as Morgan Freeman. So, if a voice has an average frequency above 130Hz, it’s assumed that vocal fry will interfere with the analysis, and frequencies below 112Hz are excluded. This works in most cases but there are still two shortcomings: it doesn’t always remove vocal fry (for example, if the person’s average pitch is below 130Hz) and it sometimes means that men who speak with a high vocal variance get reported as having a voice depth of 112Hz, when it’s probably deeper. So, it’s not perfect, and we’re working on ways of perfecting this calculation – but this is also why you have so many metrics for working out your voice depth (lowest significant frequency, mean, mode, median, celebrity matches, distribution map). If you feel like the ultimate calculation may be wrong, be sure to check out these other metrics and see how they fit together. How are the celebrity matches calculated? When you record a voice sample, Vocular analyses how often you speak at each frequency and turns that data into a distribution map, which you can see in your results. It then scales this up and overlays it with distribution maps for all of the celebrities in the database, then divides your ‘shared frequency space’ with the entire frequency space of both samples. This means that, if you have a 77% match with David Beckham, when both samples were overlain, a 77% area was shared. I’m a man with a deep voice. Why do I match with some women more than some men? As mentioned in the Voice Depth Calculation answer, some women (such as Kim Kardashian) speak with vocal fry. Vocal fry happens to occupy a frequency space between 75Hz and 100Hz, which is also ‘deep voice territory’ for men. So deep-voiced guys shouldn’t be surprised if they match with Kim Kardashian more than Michael Jackson, who has a light voice with not much vocal fry. Why are people as famous as Johnny Depp, Christian Bale, Tom Hardy etc. excluded from the database? 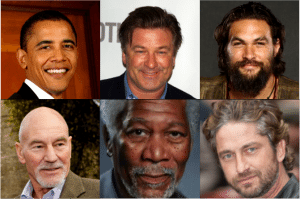 The idea of the celebrity matches is to give users around the globe some kind of grounding of their voice depth – it’s more helpful to know that your top match is Barack Obama than it is to see that your voice depth is 80Hz, at least in the beginning. This is why actors make up most of the celebrities in the database; people around the world are familiar with their voices, and immediately have a point of reference when they see their faces. However, some actors change their voices so often that there’s no point of reference. Tom Hardy’s voice depth changes like the wind, so it’s not helpful if you get him as your top match. Thus, despite their fame, it makes sense to leave these actors off the database. Where do you get your excellent images from? All images are courtesy of Wikimedia Commons, which is an online repository of free-use content. Is it app available in Android mobile. Please provide this Android users also. Hey, so I scored between 71-75 hz which is clearly very deep. Should I try to give my voice a higher pitch? I’am asking because it says around 95 hz is most optimal with Obama, Morgan Freeman ect. So studies that look at pitch and attractiveness tend to find that the most attractive ones are around the 90s – but the interesting thing is that pitch isn’t such a big issue. It’s significant – but articulation, huskiness and a lack of nasality are better predictors of which voices are most attractive. The overall plan with Vocular is that we’ll measure all kinds of other parameters that people can improve on – I even want to build an algorithm which tells the user how attractive or authoritative their voice is. Ideas like that are probably quite a long way off, but if you want to speed up the process, it’d be good if you could leave us a decent review. This means we get bumped up the Apple chart, which means more sales and more time and money we can put into the app. And let me know if there’s anything you want me to add too. Haha, good! It’ll be out this month. I think the development’s almost done, then there’s the testing which shouldn’t take much more than a few days. I’ll let you know when it’s out. Just came across this, anxious to try the Android app when it gets released! Is there any sort of waiting list or notification for when it does release? Well you’ll be able to soon. We’re working on it at the moment, so it should be about within 1-2 weeks. I’ll send you a message when it’s here. Yes, I would also love to hear more about the expected android version. Oh yeah, it’s already out. Enjoy! What does voice reliability mean? Hey Mike, the reliability effectively refers to how much voice data was recorded in a sample – the number in the brackets refers to how many instances of pitch we were able to detect. We check other things too. If there’s too much of one particular frequency, it’s likely that a car engine or some machine in the background has corrupted your data. I initially shied away from adding them to the app though, since I’m not a voice coach, just a linguistics grad who can code. You’re right to ask though, and I think I really ought to add some tailored advice to the analysis. In the meantime, just write to me if there’s anything you want to know. Turns out we have 16 classifications. Mid deep is higher than fairly deep – it’s halfway between average and deep. I should probably find some better descriptions for some of them – but they’re really just there for people who are getting to grips with the app and don’t understand where their voice falls within the general populace. Once you’ve used it a couple of times, I’d rely on the numbers and matches instead. Also, with 16 classifications, it’s tough to think of decent descriptions for some of them. Open to suggestions though. Hi, maybe I’ve asked to much: you can answer to my private mail if you don’t want to in the official comments. But I’d really like to know what those numbers in the x axis of the distribution graph stand for. Hey Angelo, I’ve just checked my inbox and rather strangely I don’t seem to have any mail from you (just in case it seemed like I was ignoring you). Sure, the numbers on the x-axis are effectively the number of times a frequency was detected, so if you have 50 on the x-axis and 90Hz on the y-axis, the app was able to detect 90Hz 50 times in your speech. It’s a basic histogram really, just mirrored to make it look nicer. Hope that helps! Does the app also look at the words spoken per minute (wpm) to gauge which celeb your voice resembles, or is it strictly based on tonality? It’s just based on frequency for now. I‘d like to add rate of speech too, although we’d probably do it by syllables per second. I really like the app. But I’d be curious as to where you sourced your vocal samples of these celebrities, because I question their validity. For example, George Clooney uses a very deep voice in some of his movies. However, those are acting roles and I doubt that’s his normal voice, because during interviews his pitch is higher. I find interviews to be much more accurate. For example, an interview with Alan Rickman clearly showed the depth and timbre of his voice dwarves Clooney, Damon, or Brad Pitt. But on your scale, supposedly those three have deeper voices than him. But their voices during interviews are not even close to Rickmans’s overall depth. Very interesting. While I love this app, I realize it has limitations and for all of us, celebrities included, our pitch will change depending on the situation. Did you select movie scenes where each celebrity used their deepest voice you had found or was it random, aggregate, etc. Keep up the good work! Hey Shayme, thanks for your message. It’s interesting you say that, in that I actually sourced all of the celebrity samples from interviews. I’d download a high quality recording from YouTube, then edit out any interviewer questions, silly voices, coughs, sneezes until I was left with nothing but a clip of the person in their normal speaking style. I do share your feeling about Alan Rickman though, and I can think of a couple of explanations for this. The first is that Vocular basically equates a deep voice with a low-pitched voice, whereas in reality there are other features that influence how deep a voice sounds. Richard Ayoade, for example, has a low-pitched voice, but because it’s famously nasal, it sounds whiny and high. There’s also a feature called ‘formant density’, which basically refers to how closely together a speakers’ frequencies are grouped. This is something that makes a voice sound more masculine – I have a feeling Jon Hamm and Armie Hammer both have rather ‘dense’ voices – but Vocular only really takes the fundamental frequency into account. So there’s room for improvement to expand the app and maybe even use machine learning to create an algorithm that calculates how deep a voice is. A second explanation might be that we’re just terrible judges of this kind of thing. Men, especially tall or heavy men, are less attuned to voice depth. I noticed this when compiling the database actually. Often I’d expect someone like Ben Affleck to have a deep voice and find his was up in the 130s, then I’d expect Cumberbatch’s voice to be pretty high, only to find that it’s one of the lowest on record. Women have always been far better judges of this in my experience. When you say men should aim for 96 Hz – Do you mean voice depth or average? These two figures are always quite different. Also, would you be able to list George Clooney on the celebs list? Hey Hemal, thank you. Yeah, average is what I mean really. Median’s probably a better measure actually, because it’s less influenced by anomalous frequencies. Clooney should already be there too. He was actually one of the first we added. Can you send me a screenshot if he’s not on your version though? Aah so he is! Probably because I have never got close to his voice I never saw him lol. Amazing app. Always wanted to get a deeper, huskier, sexier masculine voice. Any idea if you will be able to train a man to speak with a “sexier’ voice? Can you program AI to detect if voice is breathy and husky or sharp? Right now it checks the pitch and tone, but there should probably be a way to train the program to check the most “sexiest” voices and then see if learning algorithm can fine tune your voice and train it to match that ideal a bit more. That’s actually exactly what I’m planning to do. We’ll probably have things like huskiness and nasality on the app sooner, since you don’t need machine learning to detect them, but I really want to add more ‘subjective’ features to the app too. Do your vocal classifications refer to men and women? So if a woman gets average does that mean her voice would actually be low for a woman? Hey Diana, I thought that I’d the user selected ‘Female only’ matches or got a result that was unambiguously in the female range, it would show a classification that applies only to women. I’ve just tested and it looks like the first part of that doesn’t apply though. I’ll add that to the changes. Is there a particular frequency you’d like to know about? 200 Hz tends to be about average for women. This seems to be written with men far more in mind. Yeah, it’s partly because most of the literature on voice depth concerns only male voices, so there’s more for me to say about them – but also 85% of our users are male and people who search “how deep is my voice” are overwhelmingly reported as male, so I guess I ended up writing this more with a male audience in mind. Are there any parts you’d like me to expand on for women? Or new questions you’d like me to ask? It would just be interesting to have a bit on how to raise pitch as well, or at least don’t write it to assume that we’re all boys. I actually read through the Q&A after reading your comment and there is a section about female voices, so I don’t think it’s fair to make it sound like I’ve just ignored women. A lot of the questions and answers are gender neutral too. I don’t actually know who most of these celebrities are. You should add people who are really famous singers, like the Beatles or whatever. The problem with that is that Vocular only works on people’s speaking voices – and not many people actually know what a lot of famous singers sound like. So John Lennon or Paul McCartney might be a good shout, but even someone like Madonna wouldn’t be easily identified from an audio clip of her speaking in her normal voice. Huh. I’m kinda surprised that it won’t work for singing. Yeah, it’s just the spoken voice. When people sing, they reach a much, much wider range of frequencies (and this changes from song to song) so the voice matching algorithm would basically be meaningless. Can you include anime voice actors in the database? Hi L, maybe as some sort of expansion option, but I actually don’t know what any anime actors sound like and I’m not sure many people do. One tough side of the app has been finding celebrities whose voices are internationally known. Where your voice lies on the distribution for male and female for each of these stats. E.g. Voice Depth 90Hz (20th percentile men / 5th percentile women, where lower is deeper), and same for all of the other stats. In its absence, can you share a link to the mapping between classifications, average frequency, and male/female distributions? Hi Emiliano, yeah, I’m actually making a list of new voices to add to the app right now if you want to send some suggestions. Unfortunately though, singers are a difficult one since people often don’t know what their speaking voices sound like. Everyone knows who Madonna is, but very few people could identify her voice without any visual clues. But, if you know any singers with well-known speaking voices, I’d be happy to add them. Cole Sprouse would be a good one to add as an example of a male with a higher voice. Lots of young people will know his voice. Why does my voice sound deeper at 100Hz than (for instance) Edward Norton’s at 89Hz? What other factors are at play besides pitch? Wow, thanks for the quick reply! My voice isn’t nasal so that makes sense. But my voice also sounds deeper than Gerard Butler who (correct me if I’m wrong) doesn’t have a nasal voice. I think my voice doesn’t have much warmth. Any idea why that might be? Is it something you could measure? My voice doesn’t sound as deep as Armie’s and is not really similar (unfortunately). My top match on the app was Richard E Grant at 72% if it helps! My voice “booms” but doesn’t have any warmth like Armie’s. How deep is 100Hz anyway? Could I be speaking at a higher pitch than is natural for me without realising it and it comes through in the booming quality? I’m a girl and the app says my voice depth is 112Hz but my average is 174Hz and my median is 183Hz. So do I have a high or a deep voice? For older people like Queen Elizabeth II, did you use their younger voices or their current voices? Hi Noelle, yeah, generally if they’re old in the picture, it’s their current voice. So Clint Eastwood is young but the Queen isn’t. Thanks 🙂 Could you add Queen Elizabeth II when she was young? She was criticised for her high voice when she was young and she purposely lowered it. It was included in the Crown as well! Oh, that’s interesting. Yeah, I’ll see if I can find a good recording. How young do you want? I should probably find a longer audio for her current voice too. Let me know if there are other female voices you want me to add. The database could do with more. Would it be possible to analyse the tones/overtones in each voice to better match to celebrities? Is it possible to feed an audio sample directly into the app for analysis? Hi, it was Gabriella Wilde’s voice in these clips I wanted to analyse. Why is my voice classified as higher when I speak around 185 Hz and the average for women is 200 Hz? All of the female examples on the app have average or deeper voices except Emma Watson. Any idea why that is? Yeah, I have a few ideas. One of the main points is that most of the matches come from actors and, if the industry prefers people with a deeper voices or trains people to speak more deeply, you might expect the database to be deeper than average. Another thing is that I don’t totally believe the attested averages. They’re supposed to be 200Hz for women and about 120Hz for men, but I have a feeling the sample comes from undergrads who might have higher voices than average. I’m not sure how much a person’s voice changes over time though. I’d like to create my own average at some point. Oh yeah, please recommend me some higher pitched voices if you can think of any. I need to add Saorsie Ronan, but it’s been tough finding higher voices. Going by my own friends and family, I think you may be right about the averages. Some higher voices I’ve found are Jade Thirlwall from Little Mix and Cressida Bonas. Not very famous though. Maybe also Claire Foy and Naomi Watts but I’m not sure about theirs being high. Hope that helps! Sure, who else do you want on? I can’t seem to get a consistent reading so it would be really helpful. Thank you! Okay, I’m currently working on an assignment, but I’ll run it through the Windows program later. Out of interest, I’ve noticed more women commenting here than normally do. Has the app been shared somewhere recently? That’s great. Thank you 🙂 And I’m not sure, sorry! I heard about it from one of my friends.